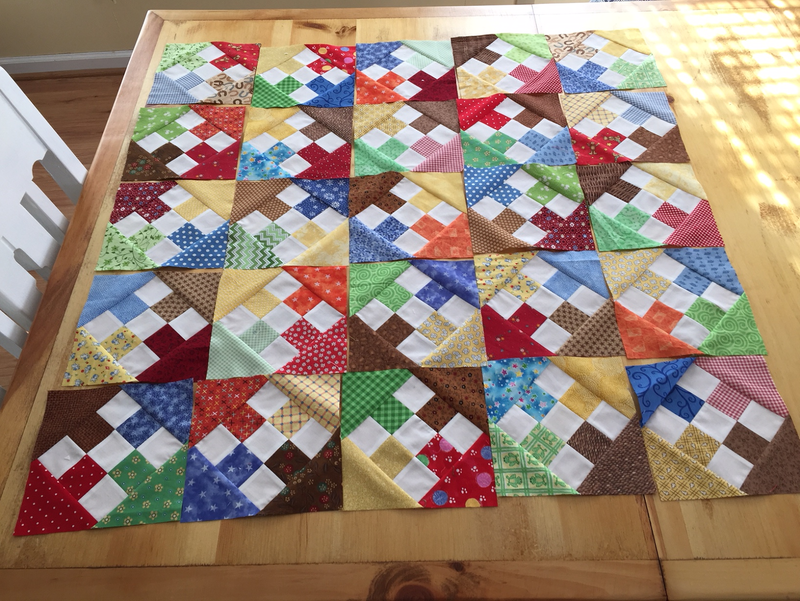 I have tried many methods for basting a large quilt sandwich, but I believe this is my favorite. I followed the tutorial "The RST Guide to Board Basting." I did do a couple of things differently, but for the most part, followed the instructions. I purchased my supplies, which are minimal, from Lowes. 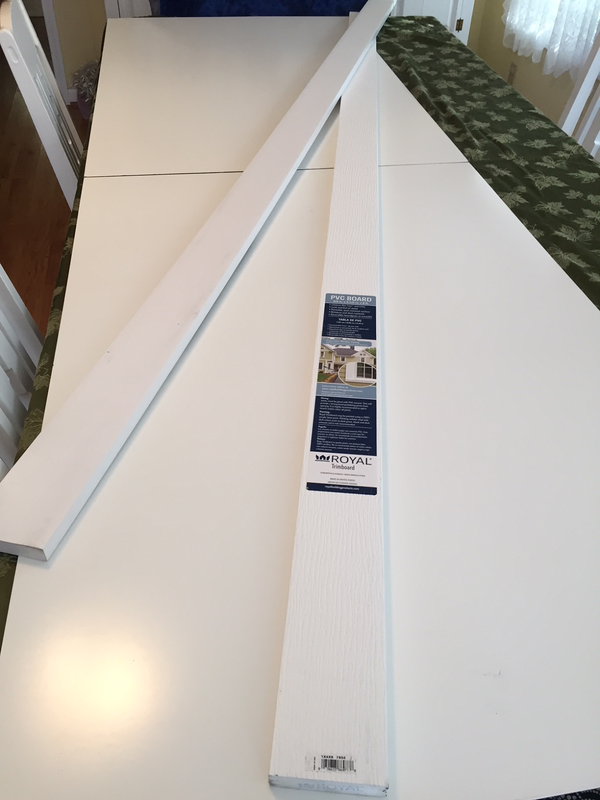 I purchased two "marker" boards to protect my table top. They are slick and easy to pin on. Its kind of like the boards they used to make peg boards, but without any holes. 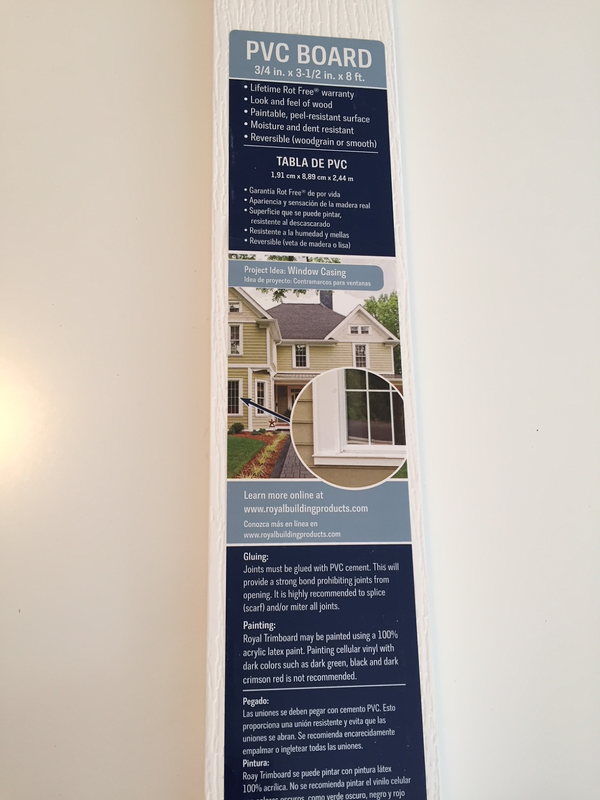 These were also finished so I think you could use dry erase marker on. I needed two to get the width of my table - I think they are 3 x 4. 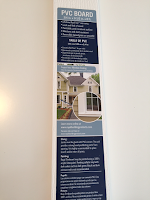 The boards for wrapping are PVC boards and are used in vinyl house covering. They have a nice finish that tape will stick to. This is where I was "wrapping" the boards. I actually taped by fabric to the board before I began wrapping them just to make sure I had the fabric straight and it would not slip. 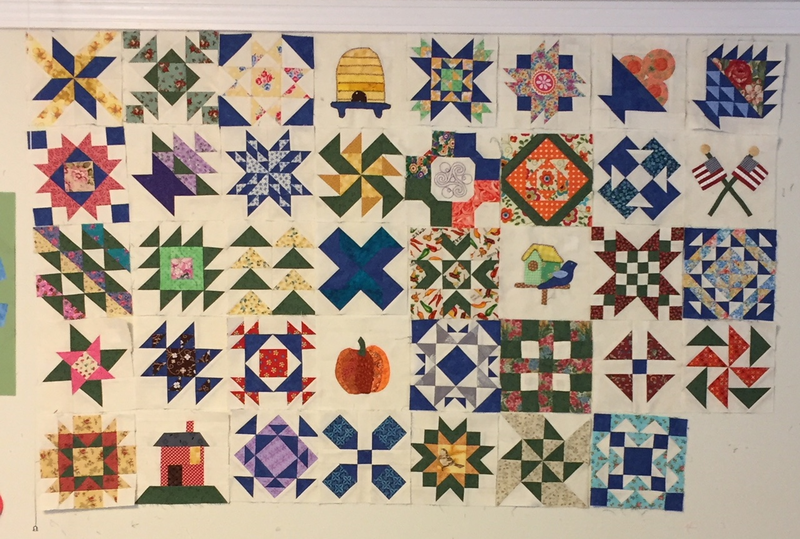 In the demo, the quilter simply folded the fabric around the board and then started wrapping. But she was doing a small quilt and I was concerned that my larger one would slip - so I taped it to the board. I was very careful to keep it straight, but even so, the backing got a little off center creating a pleat on the back. I guess its a learning process, and I did get the pleat out. I have to wonder if I had stretched the fabric a little when pressing or if maybe it was a little off bias from ripping instead of cutting. 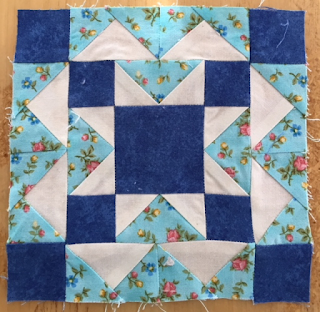 In the tutorial, she recommended starching the backing 2 or 3 times, before wrapping - I only did it once, maybe I should have done it more. Here it is all wrapped and ready to baste. 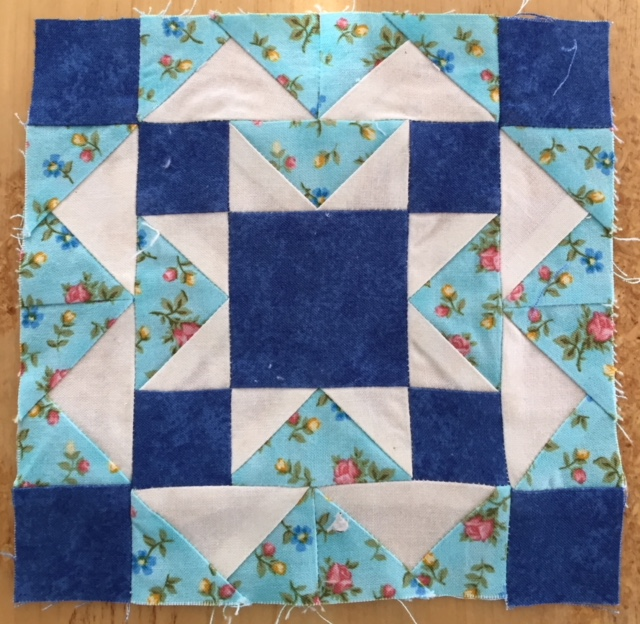 In the tutorial, the quilter thread basted her quilt and commented she felt it held the quilt together better in the quilting process. 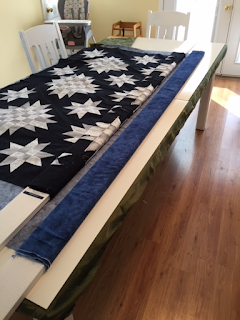 She does this for both hand quilting and machine quilting. I chose to pin baste mine as that is my preference when machine quilting. I do thread baste for hand quilting. This process was so much easier as I could just sit at the table and pin it, rather than standing over a table and reaching and hurting my back. Also just unwrapped a small section of the quilt at a time, which help to keep it straight and flat. This took me a couple of hours, but normally it would take me all morning - at least 4 hours. 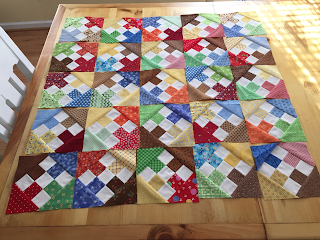 And here is my pinned quilt all set for machine quilting. 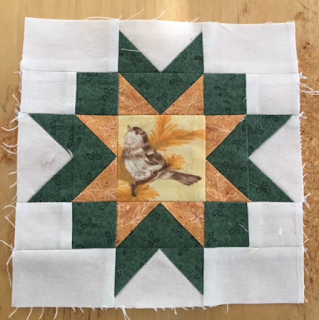 This will be a gift for my Grandson Toby who has a birthday in February, so I need to get busy. 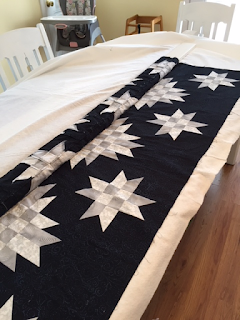 I have a couple of other quilts in the lineup for quilting as well, one for a baby shower in January. 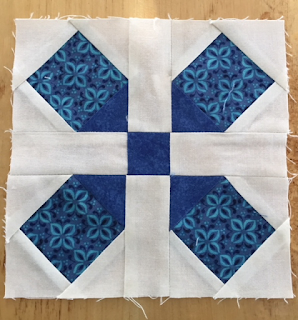 Now to decide how I want it quilted. 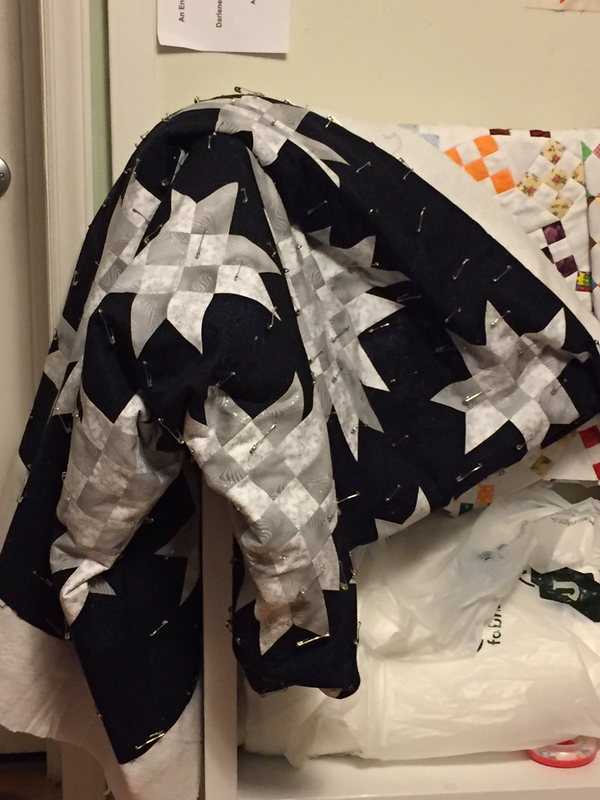 I purchased some Aurifil silvery grey thread recently to try out on this quilt. Its 100% cotton, 50 wt - looking forward to giving this a try. Its a good day even if I am battling a cold and missed out on a shopping outing with three of my closest friends....well ok, I am having a little pity party. Hopefully tomorrow I will feel much better, as my husband, brother and his wife and I are going to Old Salem. I have always wanted to visit there at Christmas and looking forward to this trip for several weeks now. Yesterday I started working on a baby quilt for one of the expectant mom's in our church. She is not finding out the baby's gender before delivery and I was in a quandary as to what kind of quilt to make. 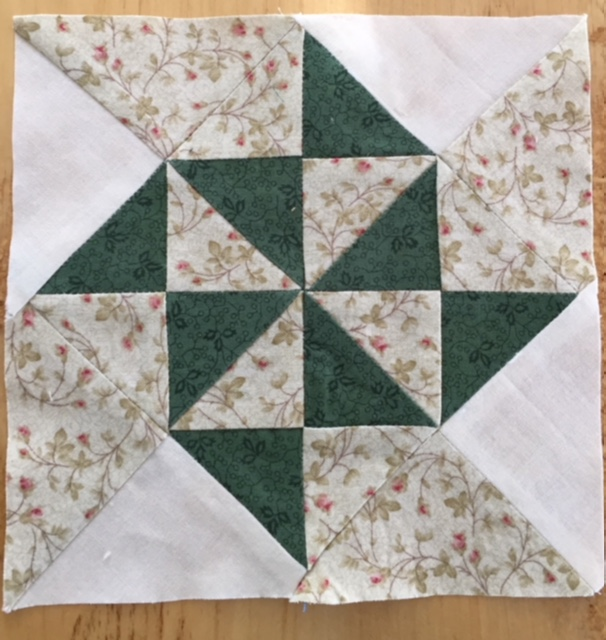 I finally just settled on a scrappy and decided to try a Schnibbles pattern for the first time. Its called Reveille and is in the book "Another Bite of Schnibbles". 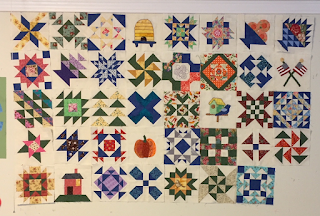 I finished all the blocks last night and laid them out on my dining table. 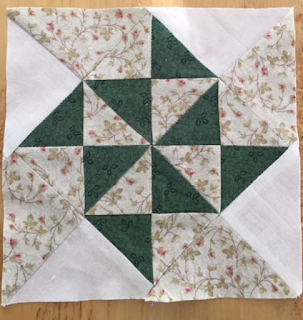 My blocks measure 7" square which is larger than they are supposed to measure according to the instructions (6 3/4")- guess I got a little too scant on my scant quarter inch seam. At least I was consistent and they all seem to line up ok. Laying out a scrappy quilt can be a challenge as I try hard not to have two colors the same touching. 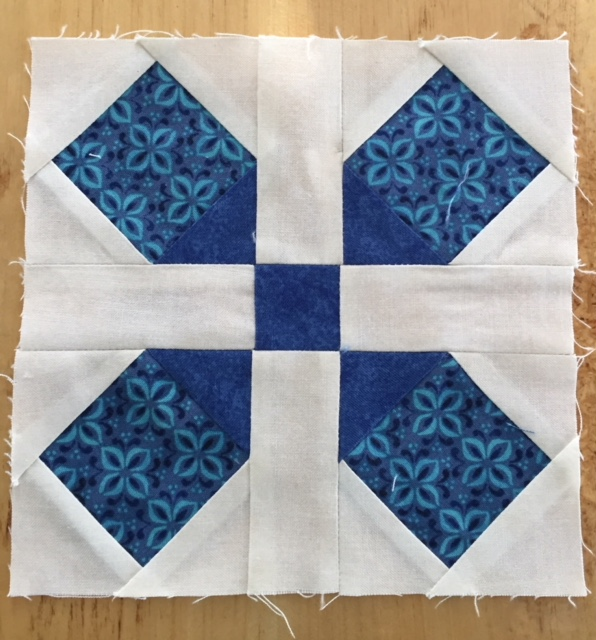 I used 53 different fabrics in these blocks and thought this would be a snap to arrange - wrong! I think I am going with this layout, although that bottom row does seem a little brown now that I look at the picture. Maybe move those blocks around a little....top right corner could use some brown. Funny when I look at the picture I see a row of 3 blue arrows pointing the same direction. Geez Louise, this is going to drive me nuts. Moda Blockhead update. There are 40 blocks out now, and I have made 39 of them. This last block, #40 is a primitive bird on a huge branch. I just cant seem to wrap my mind around primitive and therefore this block has not been completed. Seems like I remember a pretty redbird on a branch in a Mimi Dietrich book I have, gonna look for it and maybe use that pattern. Here are my most recent Moda Blockhead blocks.